If you are less than 40 years old and have no medical or eye conditions, you need an Eye Exam about every two years. If you are over 40 years old or have any medical or eye conditions, a yearly exam is very important. Note: it is very important for diabetics, regardless of age, to have a complete dilated exam yearly. Oftentimes, people get routine Eye Exams because they are experiencing difficulty with their vision. However, routine eye exams are also essential to maintaining good eye health. In addition to correcting vision problems, a routine exam can detect many eye diseases such as glaucoma and even diabetes before any symptoms are present. Early detection is key to treating such diseases and preventing vision loss. A technician will evaluate your eyes, do a pressure check (not the puff of air) and possibly dilate your eyes. During your time with the technician, she will also do a refraction. A refraction is not covered by most insurance policies, but is a necessary procedure in order to help evaluate the health of your eyes and determine your glasses prescription. (It is the part of the Exam where the technician put a device, called a phoropter, in front of your eyes and asks, “Which is better 1 or 2?”) If you are a contact wearer, the technician will evaluate your contact fit, measure lens size, tear flow, base curve and power annually. This “contact fit” is required every year in order to renew your contact lens prescription. After your visit with the technician, you will see your doctor. He will do a further evaluation of your eyes by looking through a microscope called a slit lamp to check the anterior segment, retina and optic nerve. After his evaluation, he will discuss any findings and plans. Will my insurance pay for my Exam? If you have a vision plan such as VSP, EyeMed, Davis or Superior, the plan will cover a ROUTINE Eye Exam only (nearsightedness, farsightedness and normal astigmatism). 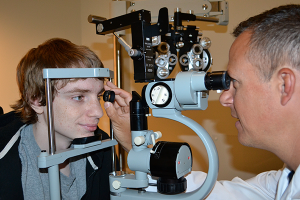 The doctors and staff at Griffey Eye Care is committed to giving you the highest quality of eye care. During your exam, our physicians will examine you for many medical conditions such as glaucoma, dry eyes, cataracts and retinal diseases. If your eye exam involves a medical condition related to your eyes that requires specific counseling, documentation, follow-up care, regular monitoring or referral to a surgeon, then your visit is no longer a routine Eye Exam. This exam would constitute a medical eye exam and be filed under your medical insurance. All co-pays and refraction fees are due at the time of service. After your Exam, you will make any recommended follow up appointments and receive a copy of your glasses and /or contact lens prescriptions. If you are ready to look at glasses, you are welcome to stop by our full-service optical boutique to visit with our opticians and pick from over 700 designer frames. Our licensed opticians specialize in face shape, coloring and vision needs. Your prescription and lifestyle are always discussed to ensure we are meeting your expectations and visual comfort.